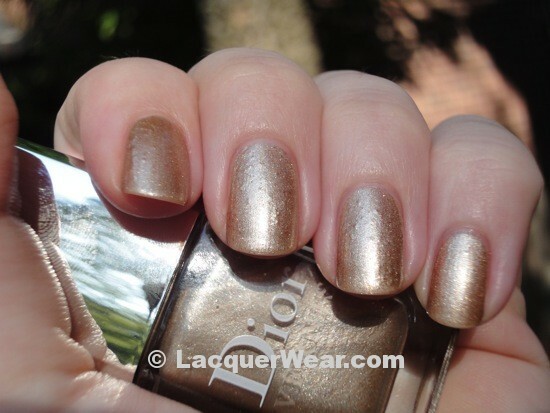 This polish was available on Dior.com for a while around the time that Dior switched to the new wider brush (around the end of 2011). I looked at it but passed, since a few swatches online showed it to be very sheer. Of course I later became obsessed with it, since it quickly disappeared from the Dior website, and I couldn’t find it anywhere. So when I popped up on an etailer recently for not too much more than retail, I felt excited and bought it. Just a few short weeks later, information came out on Dior’s Golden Jungle Collection, and Golden Era was clearly included. Argh! I could have waited and bought it for less from a normal source like Nordstrom. I swatched my bottle quickly but then didn’t get around to posting the pictures until now. It’s not that great of a formula – it’s so sheer that it took four coats to get to the opacity in these pictures. Because of all of the coats and general humidity problems I was having, I ended up with lots of icky bubbles. The color of the polish is pretty, a sandy gold with little bits of coppery orange-red that make the color richer. 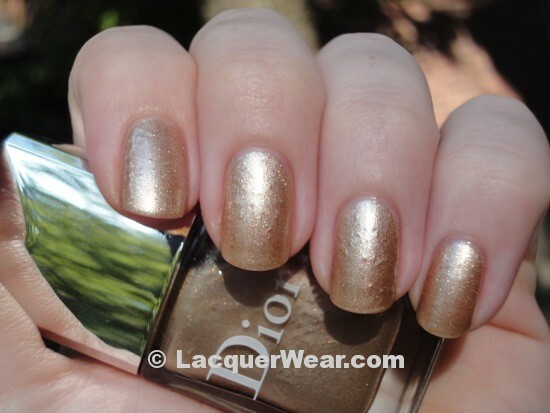 I like the color, and the way that it’s kind of neutral and toned down for a gold polish. I think it’s nice on my skintone. But I still feel just a little annoyed by it. Golden Era is available online at Nordstrom.